In an astonishing and unsubstantiated attack, the Iranian regime claimed that UN Special Rapporteur on Iran Ahmad Shaheed was bribed into criticising its appalling human rights record. The Chairman of the Iranian parliament's National Security and Foreign Policy Commission Alaeddin Boroujerdi said: "Since the very first day that Mr. Ahmad Shaheed was introduced as the United Nations rapporteur we guessed that he was an American agent, but his later reports assured us that he has been assigned to this mission by the US. "Ahmed Shaheed contacts anti-revolution elements instead of Iranian authorities to receive information and to prepare his reports, and acts in harmony with the Americans when compiling reports." Boroujerdi also claimed Shaheed was a former foreign minister of Myanmar, revealing the regime's depth of ignorance about the highly acclaimed and widely respected former politician from the Maldives. The Iranian parliament's foreign policy chief also claimed that Shaheed had failed to visit Iranian prisons and therefore his report on treatment of prisoners lacked legality. Shaheed has been banned from visiting Iran to make an independent assessment of the human rights situation and is therefore relying on sources outside the country. This has prompted accusations that he is biased. Iran insists that he should instead only rely on official government sources for information on human rights. Iran's response: "Ahwazi Arabs do not exist"
In his latest report on Iran, the UN Special Rapporteur wrote extensively on the situation facing Ahwazi Arabs following interviews with political refugees, pointing to "arrests, detentions, and prosecutions for protected activities that promote social, economic, cultural, linguistic and environmental rights." He claimed that Ahwazi political prisoners had been physically and psychologically tortured, "including by floggings, beatings, and being made to witness executions, threats against family members, and the actual detention of family members for the purpose of implicating others, or to compel others to report to the authorities." In its response, the regime displayed its characteristic chauvinistic attitude towards Ahwazi Arabs - a term used to describe Arabs from in and around Ahwaz City. It said: "Using the phrase 'Arab Ahvazis' is considered as being politically-motivated and therefore ... it is against the spirits of the Special Procedures. This phrase is in fact a faked expression. The Special Rapporteur is therefore reminded that he should not use such politically-motivated expressions and phrases which would create division." It vehemently denied any allegations of human rights abuses against Ahwazi Arabs and instead claimed that "the Arab Nation grouplet" was involved in terrorist operations and had drafted "an organizational charter in order to fight with the Islamic Republic of Iran through military operations with the aim of separating the Khouzesan province." 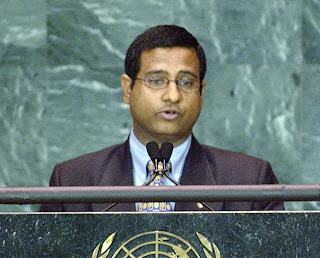 Kothari: "Iran said I would be the last"
It is unlikely Tehran will ever allow UN human rights experts to conduct assessments in Iran. Speaking to Ahwazi activists in London last year Miloon Kothari, the former UN Special Rapporteur on Adequate Housing, claimed that Iranian officials told him in 2005 he would be the last human rights official to visit the country. Ahmad Shaheed was appointed UN Special Rapporteur on Iran in 2011. Following his visit to Ahwaz during the last days of the Khatami administration, Kothari condemned land confiscations aimed at ethnic minority groups, including Ahwazi Arabs. Since then, no UN Special Rapporteurs have been permitted access to Iran, in direct violation of the country's obligations to the UN Human Rights Council. Any replacement of Shaheed is likely to result in more stalling.